This remarkable shed boasts plenty of unique features which help to set it apart from the competition. With an incredible 15 year warranty, you can relax in the knowledge that it is built to withstand all weathers. Interchangeable panels allow you to install the fixed styrene glazed windows on either side of the shed, giving you more flexibility in terms of privacy and where you decide to install the shed. The timber has been pressure treated which means you do not need to treat it annually. This is a big benefit if you just want a shed you can assemble and use right away. Not many overlap buildings offer such durability. One of its main, unique features is the fact it comes with a Corrugated Onduline roof. This is not just resistant against heavy downpours, but it is also capable of withstanding wind speeds of up to an incredible 120mph. So not matter how bad the weather gets, you can be sure this roof will stay put. It isn’t just its weatherproof qualities that set it apart either. Thanks to its lightweight design, it is said to knock up to two thirds off the installation time. The single door benefits from a wide design and can be padlocked for great security. It is worth noting that Shed Store don’t actually give you a padlock and this will need to be bought separately. Solid sheet floor. 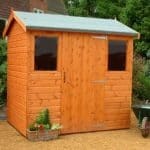 Whilst suitable for lighter storage, this shed wouldn’t be the best choice for heavy equipment. 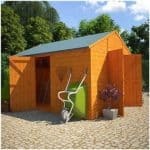 This shed belongs to the Shed-Plus range and it provides a medium level of storage space. If it came with a tongue and groove floor, we’d also recommend it for use as a workshop. However, as it is instead made from solid sheet board, we would only advise you use the building for storage. This isn’t just a simple wooden storage shed however, It comes with a very unique corrugated Onduline roof. This makes it one of the most weatherproof buildings available on the market. Although you can’t really tell from the photo, this shed has a fairly large depth and width compared to a lot of its competitors. This gives you a lot of storage space to work with. The height of the door compared to the eaves adds a unique style, giving the front of the shed a striking design. The actual width and height of the door is the same as what you will find on most storage sheds. When opened out however, you’ll notice you have plenty of room to manoeuvre even awkward and bulky belongings. It is a tall building with a brilliant amount of headspace. The majority of sheds feature an apex or pent roof with a sand felt covering. So the fact this one has a corrugated Onduline roof truly makes it one of a kind. It has the common apex design, but rather than felt it comes with a corrugated barrier. This is gives it maximum protection against the British weather. Not only does it easily withstand heavy downpours, but it is also able to fight off winds of up to 120mph. This is an incredible benefit and ensures the roof has a very long lifespan. It also means you do not have to spend anything extra on upgrading the roof. The floor isn’t as impressive as it is created with solid sheet OSB material. Although it is perfectly suitable for light and medium weight tools and gardening essentials. We would not recommend storing anything heavy without first upgrading the strength of the floor. However, compared to competitor sheds, this one does benefit from pressure treated floor joists which add to both its longevity and stability. If you like your sheds to have a rustic design, you’ll love this one. The rough-sawn overlap cladding is preferred by manufacturers because it is a lot more affordable to work with. The savings they make are passed on to the customer, so you get a low cost shed that is still really reliable. This shed is slightly different from its overlap competitors due to the unique pressure treatment used on the timber before it is sent for delivery. This unique treatment is more effective than dip treatment and it really lengthens the life of the cladding. So the usual problems you tend to have to worry about such as warping, are minimised with this building. 28mm x 28mm framing offers superb structural support. As the exterior walls are made from lightweight overlap, the standard frame offers much better support than it does on heavier tongue and groove clad buildings. Overall we’re impressed with the quality of the overlap used. It really stands out from the majority of overlap sheds. Who enjoys spending hours treating their new shed? Well, the good news here is you don’t have to apply a treatment after assembly or annually thereafter. Thanks to an advanced pressure treatment that is used on the timber by the manufacturer, treatment requirements are minimised. In fact, you do not need to treat the shed at all for at least a couple of years. Pressure treatment is the highest quality treatment an outdoor building can receive before it is shipped. It is a drawn-out process that coats not only the surface of the wood, but the interior too. Hydraulic pressure is used to force a high quality preservative inside the timber and before it dries, a low pressure is introduced to ensure any excess treatment is absorbed into the surface. We would recommend treating the shed after a couple of years, but the truth is you don’t really need to. The manufacturer doesn’t supply any information on treating the building so it’s safe to assume it doesn’t need any. 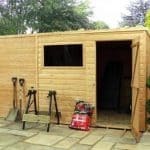 However, we feel adding even just a water based treatment every couple of years, will help to give you reassurance and really ensure the shed is protected against harsh weather. The warranty that comes with this model is superb. The weatherproof barrier provided by the pressure treatment increases the warranty from 10 to an impressive 15 years. Though created with overlap, the single hinged door looks surprisingly stylish. The silver hinges don’t just secure the door onto the shed, they also look great too. With a pad bolt attached, the door will always stay shut when you need it to. It also makes it possible for you to add a padlock for complete security. It does come with fairly standard measurements, but you will notice there is plenty of width to comfortably transfer your storage. Two styrene fixed windows are also supplied, letting in a lot of light. If you’re only likely to use the shed during the day then this prevents the need for an artificial light to be installed. The styrene glazing is also beneficial as it is strong and shatterproof. Even though it is tougher to break than single glazing, if it does you have peace of mind that there is a lesser risk of injury. If you have young children or pets then this is a fantastic benefit. This may be one of the best weatherproof sheds around, but it isn’t the most secure. However, you’ll find a lot of modern, low price sheds aren’t offered with much security. The fact the door does have a pad bolt is promising as it makes it easier to secure the shed yourself. A padlock installed onto the pad bolt will stop thieves in their tracks and help to keep children out of the shed too. Privacy wise, the two windows are pretty large and the overlap will not support the addition of any type of covering. So there’s sadly not a lot you can do about that. 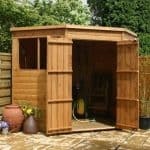 Of course, with proper security it does lower the risk of the shed getting broken into, but we’d still suggest making sure that anything valuable within the shed kept out of view. To truly get the most out of this shed, you may want to think about investing in the limited number of extras and customisation options available. The solar light may come in particularly useful. It is one of our favourite extras on offer from the Shed Store and it ensures you have plenty of lighting in the shed all year round. Unlike electrical packs, this light does not need to be connected to the mains. It uses a remote solar panel to charge the batteries of the light. So renewable energy powers the six LED bulbs, creating a bright light which lets you easily see what you’re doing once the sun goes down. It’s surprisingly great value for money and is very simple to install. The Wooden DIY Shed Base Kit is something we’d usually highly recommend. If there isn’t a firm, solid surface to build the shed on top of then this will still come in useful. However, as the building comes with high quality pressure treated floor bearers, the shed is lifted off the ground and offers fantastic stability. If you do find you need a sturdier base then this is a good option as it comes with a 15 year warranty and makes erecting the building very quick and simple. Another extra we really like is the pack of 4 shed hooks. It is well known that overlap cladding isn’t suitable to have shelving or hooks installed onto the interior wall. This is because it won’t support anything heavy and hooks are typically nailed into the wall which could cause damage to the thin timber. However, these hooks are designed with overlap cladding in mind and they simply slot in-between the overlap panels. Just remember they aren’t designed to hold heavy tools. Finally for security there is a complete Yale security alarm kit or an exceptional alarm padlock. As it comes with a pad bolt, you only really need the alarm padlock to make sure the shed is secure. It sounds a high pitched alarm if the padlock is tampered with and this alarm will only stop once vibrations and movement are no longer detected. It’s enough to scare off even determined thieves. Though you could argue parts of this shed could be improved, its overall quality compared to similar sheds is impeccable. The roof in particular is impressively designed. As the quality does differ throughout the shed’s design, it isn’t as durable as some stronger tongue and groove clad sheds. However, as mentioned the roof does add a substantial amount of longevity to the building. In particular, it protects the shed from extremely high winds, as well as heavy downpours. The floor bearers are pressure treated so they will also withstand damp conditions, boosting its rot resistance. There is more depth than there is width, but you can still store fairly wide equipment in here. The only bad thing we should mention is the fact you can’t add shelves to the walls. However, you could invest in storage units if this is a problem for you. 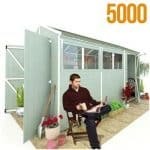 Shed Store don’t give any estimation as to how long it will take you to build this shed. We’d advise leaving 3-5 hours to properly assemble it. The installation itself is straightforward and full instructions are provided. You are also given all of the fixtures that you will need too. Thanks to its long-lasting design and fantastic roof, this shed does offer extremely great value for money. It will need treating annually to protect the overlap cladding, but we think it comes at a very good price for what you get. Final Thoughts: If you’re looking for a shed that you don’t have to maintain, is affordable and which offers something a little different, this great Shed-Plus model is highly recommended. 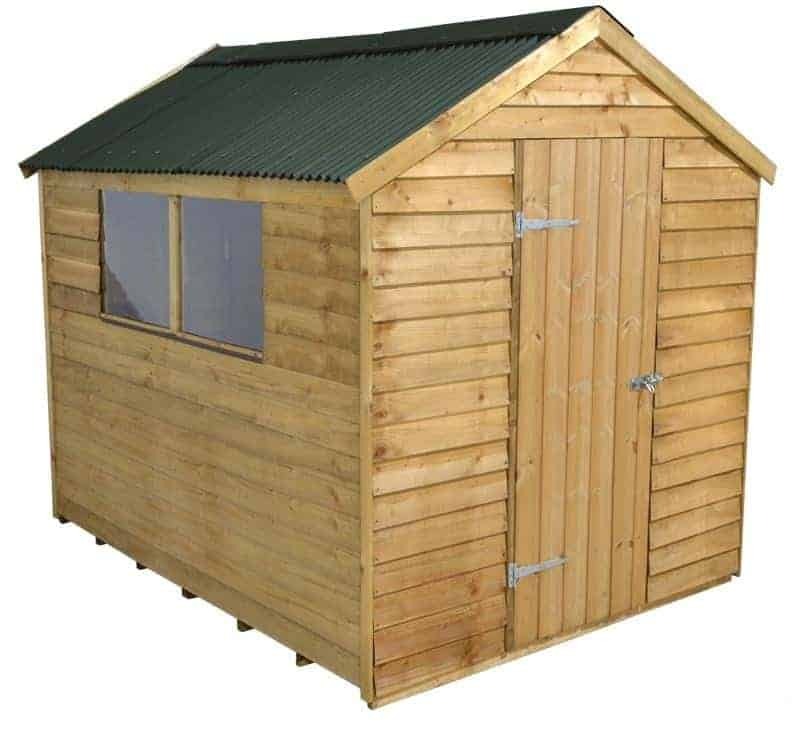 Complete with a fabulous 15 year warranty, it is one of the best sheds we’ve reviewed. Despite being so affordable, this building has an array of exceptional features. The Corrugated Onduline roof is especially noteworthy, offering extreme protection against both high winds and heavy rain. No matter what the weather, your possessions are going to be kept dry and safe. We do recommend buying a good quality padlock to keep the shed secure and it also isn’t recommended for heavier storage. 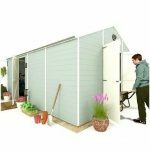 However, if you’re simply looking for somewhere to store your light gardening equipment, this is definitely one of the best sheds to consider.